Here is a brief synopsis of the story of Midland Secondary School as told by former student and teacher Chester Graham. Note that MPDHS stands for Midland Penetang District High School and MSS stands for Midland Secondary School.
" I was a student at MPDHS during the 60's. MPDHS opened in 1956. I attended there from 1961 till 1967 and taught there from 1973 till 2000. The school changed to MSS in 1965 just after Penetang opened it's own high school. I believe the bleachers were in the gym when MPDHS first opened in 1956 and were taken out when the gym became the cafeteria in the early 70's when an addition was added to the school including a new triple gymnasium. Part of those bleachers were put in the theatre arts classroom but I don't know if they are still there." My brother has, on a number of occasions picked up wood that was old or had a story to it. 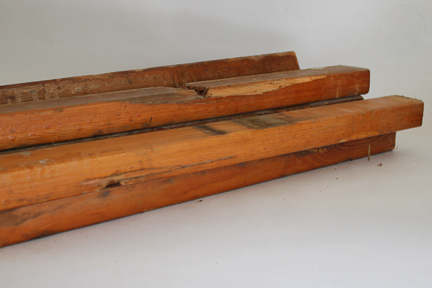 One such time he collected the old fir 1 x 2's which were once the bleachers for the Midland Secondary School. The wood was pretty 'ratty' but I have trouble turning down material that comes without a price tag. 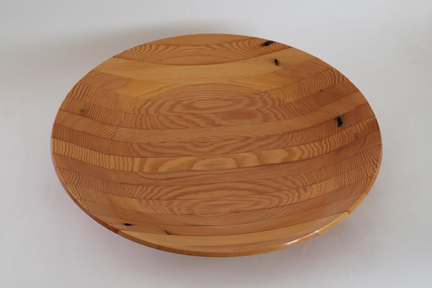 Over the years I have made 3 pieces from this fir. 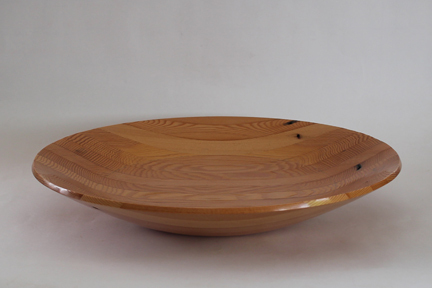 The fourth piece, which I made for this show, is a shallow bowl. Fir has that interesting property that the more you sand it the rougher it gets. This is not precisely true but what happens is that the year rings, which are very resinous, get very hard as the wood ages. 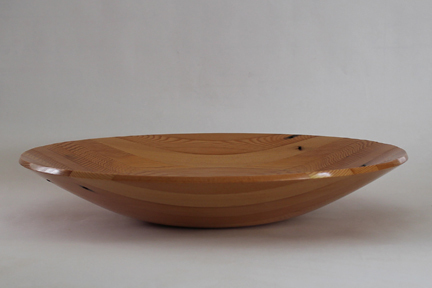 The fibre in between stays soft so as I sanded the bowl the surface became very uneven and textured. If you have an opportunity to visit my show, run your fingers over the inside of the bowl and you will see what I mean. I have called the bowl "A Cheer from the Crowd!". The vase on the right is from the same material and shows off the wonderful grain patterns of fir.